This Justice League medium jump is the perfect bouncy castle for aspiring superheroes, allowing plenty of room to practice those superhero moves. The Justice League characters are ready to welcome visitors, with smiles from the Green Lantern Superman, Batman, Flash and Wonder Woman. This adventuresome bouncy castle includes a pair of three-dimensional "Justice League" logos, letting visitors know the location of this fun-filled jump. 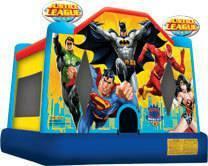 This awesome bouncy castle is part of a complete line of licensed Justice League products, including a range of jumps, combos, games and more. The moonwalk is the perfect way to combine fun and healthy activity, and will add value to any Family Fun Center or indoor playground! With a variety of colors, shapes and themes, our jumps offer kids of all ages exciting aerobic activity. This jumper has 360-degree mesh windows, so parents and spectators can have a clear view of all the fun. Our bouncy houses are made safe and secure with lite n strong%u2122, fire-resistant vinyl making it safer and more durable.